Educators looking to continue their education and service to Dallas ISD students can apply for the annual $20,000 scholarship offered by Credit Union of Texas in honor of former Dallas ISD administrator William H. Cotton Scholarship. 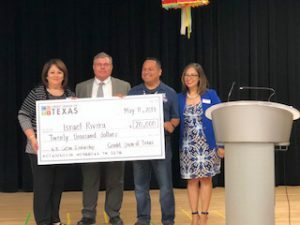 The scholarship offers $20,000 in financial assistance to a Dallas ISD educator seeking to pursue post-baccalaureate education to further their career in the field of education at Dallas ISD. The deadline to submit the application is March 29, 2019. Go here to download the application. Finalists for the award will be contacted by April 30, 2019, and the winner will be named by May 30, 2019. Principal of Jose “Joe” May Elementary, Israel Rivera, received the 2018 scholarship.